In this week’s reading Moshe writes the following, אֱלֹהִ֖ים לֹ֣א תְקַלֵּ֑ל וְנָשִׂ֥יא בְעַמְּךָ֖ לֹ֥א תָאֹֽר׃ 22:27 You shall not revile God, nor put a curse upon a chieftain among your people. מְלֵאָתְךָ֥ וְדִמְעֲךָ֖ לֹ֣א תְאַחֵ֑ר בְּכ֥וֹר בָּנֶ֖יךָ תִּתֶּן־לִּֽי׃ 22:28 You shall not put off the skimming of the first yield of your vats. You shall give Me the first-born among your sons. כֵּֽן־תַּעֲשֶׂ֥ה לְשֹׁרְךָ֖ לְצֹאנֶ֑ךָ שִׁבְעַ֤ת יָמִים֙ יִהְיֶ֣ה עִם־אִמּ֔וֹ בַּיּ֥וֹם הַשְּׁמִינִ֖י תִּתְּנוֹ־לִֽי׃ 22:29 You shall do the same with your cattle and your flocks: seven days it shall remain with its mother; on the eighth day you shall give it to Me. וְאַנְשֵׁי־קֹ֖דֶשׁ תִּהְי֣וּן לִ֑י וּבָשָׂ֨ר בַּשָּׂדֶ֤ה טְרֵפָה֙ לֹ֣א תֹאכֵ֔לוּ לַכֶּ֖לֶב תַּשְׁלִכ֥וּן אֹתֽוֹ׃ (ס) 22:30 You shall be holy people to Me: you must not eat flesh torn by beasts in the field; you shall cast it to the dogs. לֹ֥א תִשָּׂ֖א שֵׁ֣מַע שָׁ֑וְא אַל־תָּ֤שֶׁת יָֽדְךָ֙ עִם־רָשָׁ֔ע לִהְיֹ֖ת עֵ֥ד חָמָֽס׃ (ס) 23:1 You must not carry false rumors; you shall not join hands with the guilty to act as a malicious witness: לֹֽא־תִהְיֶ֥ה אַחֲרֵֽי־רַבִּ֖ים לְרָעֹ֑ת וְלֹא־תַעֲנֶ֣ה עַל־רִ֗ב לִנְטֹ֛ת אַחֲרֵ֥י רַבִּ֖ים לְהַטֹּֽת׃ 23:2 ‘You shall not follow the masses in doing evil, nor shall you testify in a dispute so as to turn aside after a multitude in order to pervert justice; There are a number of commands here that are related to the heart, to what we find most important, and to justice, truth, and faith. The name of this week’s reading, Mishpatim “judgments” or “laws” describes the lengthy collection of statutes the Lord is giving to His people in regards to living in this life. He says you are not to revile God or put a curse upon a chieftain among your people. To revile is to blaspheme meaning one is not to take the name of God in relation to cursing. Rabbeinu Bahya on Shemot / Exodus 22:27 Part 1 states. “אלוהים לא תקלל, ‘you shall not curse a judge.’ This is a warning for the party who has been convicted of a crime or sin not to curse the judge who convicted him. This subject follows the subject of the need to extend loans to fellow Jews as on occasion disputes arise over whether a loan has been repaid, the debtor either denying he had received it or the lender claiming that he had not been repaid. Such disputes are submitted to judgment. It is quite possible that the party whose claim is rejected (if he feels that he has been wronged) will curse the judge who has wronged him. 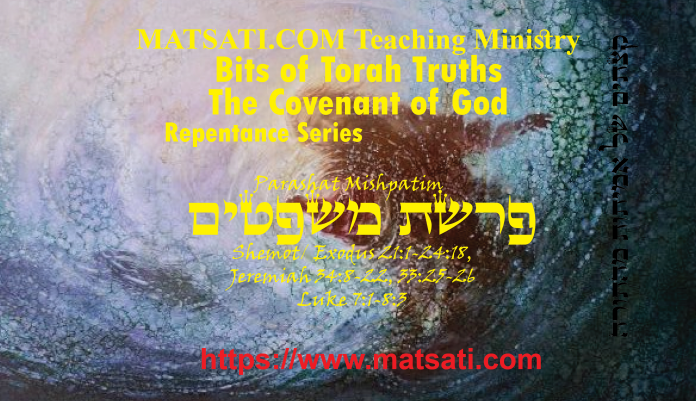 This is why the Torah has to warn that one must not engage in such conduct.” This is connected to taking from the first fruits and giving it to the Lord, from the flocks, and even from our sons. These commands go on to describe how we are not to be as beasts eating flesh torn by animals, to tell lies, or to go along with the crowd when the masses are doing evil. God’s people are to be holy and righteous and not act in a forbidden manner when others are doing so. We are not to be influenced by the fact that the majority thinks differently from us. This appears to be what is going on today in our culture. The joining of hands with ungodly thought processes and accepting and placing first in our lives the cultural norms as opposed to the Word of God. When studying the Tanach and the Apostolic Writings, we believe that God anoints His people to heal, to preach, and to witness his magnificent work in our lives and speaking of this to others. This is all true and necessary, but it seems today Christians stop short. The Lord God of Israel also wants to anoint us to think! The Holy Spirit of God and the mind are not our enemies. The Lord enables us to think and this is just as important and necessary for us as believers as the need to proclaiming the gospel. Remember the war that we are in is within the mind. This is why the Lord gave us the command to not spread false rumors. Chizkuni on Shemot / Exodus 23:1 Parts 1 and 2 states, “לא תשא שמע שוא, ‘do not spread false rumours’ the expression תשא from the root נשא, ‘to carry,’ is used here as ‘carrying by mouth;’ another example of the same expression being used in a similar context is found in Psalms 16,4: ובל אשא את שמותם על שפתי, “so that their names will not pass my lips.” In other words: ‘let me not utter a lie.’ אל תשת ידך עם רשע, ‘do not join hands with a wicked person.’ It follows automatically that you must not join him in giving false testimony.” This is also connected to following the crowd as Sforno on Shemot / Exodus 23:2 Part 3 states, “לנטות אחרי רבים, do not be influenced by the fact that the majority thinks differently from you. Assuming that in a trial 10 of the 23 judges had expressed the view that the accused was innocent whereas eleven had expressed the view that the accused was guilty,” Notice the emphasis here on how important it is not to have deceit in the recesses of the heart (lies) and to not join hands with the wicked. This is true because of who we are called to be and the spirit of God dwelling within us empowering us to righteousness, holiness, justice, and truth. The Lord God in heaven sent His son to set us free from the slavery of sin, and to establish in our lives righteousness, holiness, justice, and truth as a people who are redeemed. We are not slaves to unrighteousness but to the Messiah, and in being so, we are slaves to righteousness and truth.